Surveys can be printed out as PDF files, and distributed either by person or by mail to the respondents. The layout of the printable PDF survey can be adjusted. Both general layout settings and specific settings for different types of questions are available. General layout: These are the settings for the entire survey. Page size: Different page sizes are supported, currently including A0(2384,3370), A1(1684,2384), A2(1191,1684), A3(842,1191), A4(595,842), A5(420,595), A6(297,420), A7(210,297), A8(148,210), A9(105,148), A10(73,105), B0(2834,4008), B1(2004,2834), B2(1417,2004), B3(1000,1417), B4(708,1000), B5(498,708), B6(354,498), B7(249,354), B8(175,249), B9(124,175), B10(87,124), LETTER(612,792), POSTCARD(283,416), NOTE(540,720), LEGAL(612,1008), TABLOID(792,1224), EXECUTIVE(522,756), ARCH_A(648,864), ARCH_B(864,1296), ARCH_C(1296,1728), ARCH_D(1728,2592), ARCH_E(2592,3456), FLSA(612,936), FLSE(648,936), HALFLETTER(396,612), _11X17(792,1224) and LEDGER(1224,792). The two values in the parenthesis after each page size represent the width and height of the page, in points (1 inch = 72 points and 1 cm is about 28 points). The default page size is A4. Background image: A background image can be added to the PDF file. For example, a company logo can be used as background image. By clicking the icon on the right, the image upload/selection dialog box will appear. Enable page breaks: If this checkbox is checked, the survey will be printed out with page breaks as set in the Question overview. The default setting is not checked, and thus the survey will be printed out in a consecutive manner. Vertical layout: If this checkbox is checked, the rating choice items will appear in vertical format. Note if the choice items can be put on a single row, check the vertical layout will have no effect. The default setting for this checkbox is not checked (i.e. horizontal layout). 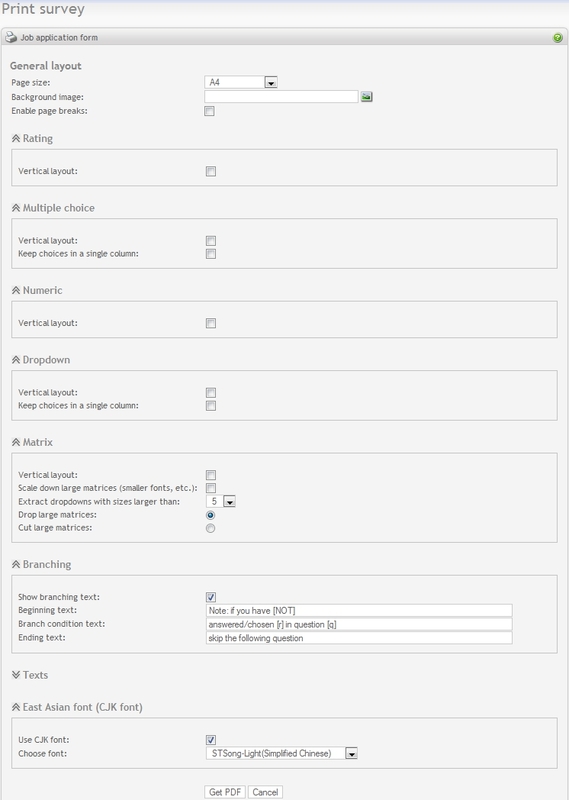 Vertical layout: If this checkbox is checked, the multiple choice items will appear in vertical format. The default setting for this checkbox is not checked (i.e. horizontal layout). Keep choices in a single column: If this checkbox is checked, the choice items will appear in a single column, and there will be no effect whether or not Vertical layout is checked. The default setting for this checkbox is not checked (i.e. choices on multiple columns). Vertical layout: If this checkbox is checked, the prefix (if exists), the numeric field and postfix(if exists) will appear vertically. The default setting for this checkbox is not checked (i.e. horizontal layout). Vertical layout: If this checkbox is checked, the dropdown items will appear in vertical format. The default setting for this checkbox is not checked (i.e. horizontal layout). Keep choices in a single column: If this checkbox is checked, the dropdown items will appear in a single column, and there will be no effect whether or not Vertical layout is checked. The default setting for this checkbox is not checked (i.e. dropdown items on multiple columns). Vertical layout: If this checkbox is checked, the matrix will appear in vertical format, i.e. rows become columns and columns become rows. The default setting for this checkbox is not checked (i.e. horizontal layout). Scale down large matrices: If this checkbox is checked, when the matrix is larger than certain size, smaller fonts will be used to print the labels and texts within the matrix. The default setting for this checkbox is not checked (i.e. do not scale down). Extract dropdowns with sizes larger than: If a matrix cell is of type dropdown list, the dropdown items will be extracted when its size is larger than this specified value. In that case, only the dropdown label will appear at the cell position, and the extracted dropdown list will be printed after the matrix. The size value can be adjusted in the range of 3 to 10. The default value is 5. Drop large matrices/Cut large matrices: This is a choice group. If Drop large matrices is chosen, very large matrices will be dropped; otherwise, if Cut large matrices is chosen, the matrices will be cut and only part of the columns are printed. Show branching text: The branching text will appear before appropriate questions if this checkbox is checked. Beginning text: The beginning part of the branching text. It can be modified if needed, but please do not modify “[NOT]”, since it is a place holder used by include branching. Branching condition text: Each branch condition within the branch will use this text to show its details. It can be modified if needed, but please do not modify “[r]” or “[q]”, since they are place holders used to represent the response and the question number respectively. Ending text: The ending part of the branching text. It can be modified if need. Please do NOT modify/delete “[NOT]”, “[r]” and “[q]”, since these are important place holders. Modify or delete them will cause the branching text being improperly printed. Texts: These are various text segments used for printing the survey. If the language used in the survey is not English, these texts need to be translated to the survey language. East Asian font (CJK font): If the survey contains East Asian fonts, including Simplified Chinese, Traditional Chinese, Japanese and Korean, by checking the "Use CJK font" checkbox, various CJK fonts from iText can be chosen and used to print out CJK characters. The font should support characters to be displayed, and the font file should exist on the server at the given path. For a particular survey, only settings of those question types that actually appear in the survey will be expanded, others are collapsed. This is for the user's convenience. A collapsed question type setting can be expanded by clicking the icon to the left of the question type. After choosing the settings, you can click Get PDF to generate the printable survey in PDF form. Currently the file is generated with PDF version 1.4, since this is the most commonly used version. Please make sure that you have a proper PDF viewer that can read and print PDF-1.4 files.